Postponed by treacherous weather, our Annual General Meeting (AGM), including the election of our 2017 Officers, will instead be held on February 7th. This meeting is a great opportunity to discover the breadth and diversity of our all-volunteer organization. Note that Dugald Cameron has graciously agreed to postpone his presentation to June 6th. 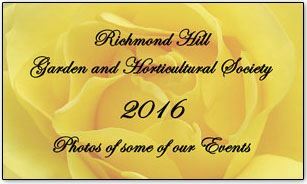 Following the business portion of the meeting, Susan Biensch will present a photographic slideshow featuring many of our 2016 events and activities. Refreshments will be available at 7:30 pm, rather than after our meeting. As well, Jennifer Pyke and Barb Platt will be collecting seed contributions from members, which will be packaged for sale later in the year. And, the Bring-and-Buy table will be featuring the sale of books from our library, which is being discontinued. Click here for a list of titles.